Between 45 and 50 years of age, most women will enter into menopause. Referring to the final menstrual period and marking the end of a woman’s reproductive phase of life, menopause comes with a range of less than ideal symptoms including hot flushes, aches and pains, loss of libido and, perhaps the most detrimental to your day to day life, disturbances in your normal patterns of sleep. Despite these drastic life changes, there are some simple self management strategies you can use which can mitigate the more disruptive effects of menopause and maintain the lifestyle you’re used to. What causes menopause and how does it impact sleep? Menopause is caused by the ovaries ceasing production of estrogen and progesterone and consists of two stages; peri-menopause and menopause. Peri-menopause is the transitional stage into menopause when a woman’s hormones begin to alter and her menstrual cycle begins to change. Cycles may become longer or shorter and other hormonal responses such as hot flushes may begin. Menopause officially commences when a woman experiences no menstrual periods for twelve months. This life stage is accompanied by a variety of physical and psychological symptoms triggered by a change in hormones, many of which can severely impact on your ability to get a good night’s rest. Hot flushes and aches and pains during the night mean you can be woken up suddenly, uncomfortable and drenched in sweat. Insomnia is also common in menopausal women, while some women develop obstructive sleep apnoea and excessive snoring during this time, diminishing their sleep quality. Insufficient sleep may cause you to experience daytime drowsiness, a loss of concentration and can even impact on your mental health with anxiety and depression arising as your body doesn’t have a chance to replenish the feel good hormones produced when you sleep. How can you improve your sleep during menopause? Wearing loose clothing, light nightwear and ensuring there’s no excess bedding on your bed. This will reduce instances of waking up overheated. You can also sleep with a fan or air conditioner on to avoid excessive temperatures in your bedroom and ensure good air circulation. Eating healthily. By avoiding overeating (especially close to bedtime), maintaining a healthy weight and exercising regularly you will sleep more deeply and avoid being awoken by more minor menopausal symptoms. Avoiding nicotine, caffeine, alcohol and spicy foods, all of which can potentially bring on hot flushes. Taking Evening Primrose Oil (EPO). EPO aids in the production of prostaglandins which are thought to help counter hormonal changes in the body which occur during menopause. Limit stress as much as is possible. Utilising relaxation techniques such as mediation, massage, exercise and deep breathing can all help you reduce stress, fall asleep easier and stay asleep. Magnesium can also be helpful in relieving mild stress and anxiety as well as alleviating aches and pains. If you are experiencing excessive anxiety, speaking to a professional about it can be beneficial and allow for a better night’s sleep. While menopause brings with it a range of symptoms which can easily lead to diminished sleep quality, making small changes to your life and utilising these simple techniques can help ensure you are as well rested as possible, ready to get on with your life. If you’re looking for some extra support to get a good night’s sleep, Nutra-Life Magnesium Sleep contains a combination of three sources of Magnesium that help with both falling asleep and staying asleep. Taking one or two capsules per day provides you with a source of Ziziphus and Passion flower which act as natural solutions to sleep deprivation. While we all work to have the best night’s sleep possible, it’s important that we celebrate and embrace the ageing process. That’s why we’ve partnered with stylist and model, Mel Brady, to talk to women who are taking charge and living well. 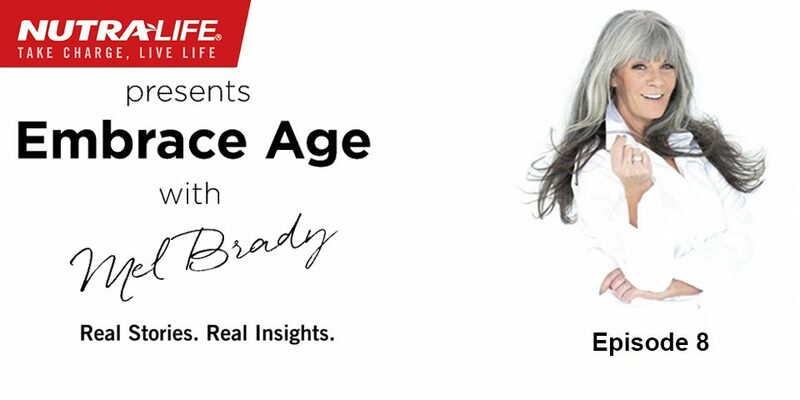 Watch the full episodes of Embrace Age here and listen to the full conversations via the Embrace Age Podcast.